Gulf Coast Camper Rentals is located in Bay St Louis, Mississippi about an hour east of New Orleans. They specialize in renting out campers and RVs. A few years ago, the owners decided to help others enjoy the great outdoors by renting campers and helping people learn how to use them. Their motto is, “We set it up. You enjoy it!” That’s why Coastal 90 proudly endorses their great company and their goal of helping people Get Outside! 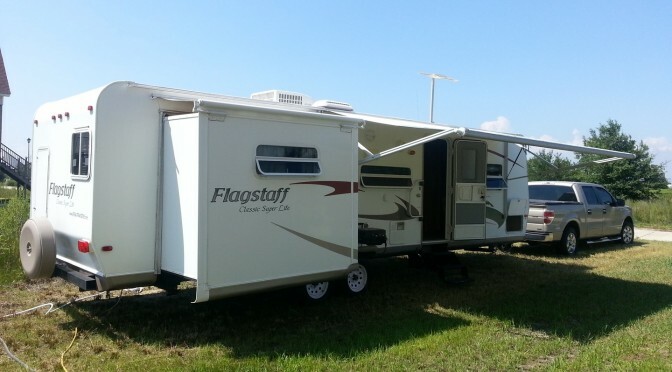 Their 31′ Flagstaff Classic Super Lite Travel Trailer can sleep 6 adults comfortably. Only $75.00 per night for local delivery. They can supply the linens for the three queen sized beds and the one twin bunk for a fee of $30.00 per rental. Pots and pans are supplied along with kitchen cooking utensils, a coffee pot and toilet paper (special toilet paper is needed ue to the fragility of the septic system in RV’s). The RV is equipped with a gas grill that mounts to the side of the camper. Plus, they work hard to ensure the environment is protected during camping adventures, so you’ll have peace of mind knowing that their company contributes to our environment’s sustainability. How much fun would the kids have running around the park and enjoying nature? Get unplugged and get some sun! Don’t forget, Mississippi’s Beaches are white sandy gems. So, get your camping gear ready, find your camp fire wood and schedule your time away from it all with Gulf Coast Camper Rentals today!